Checking the conditions of the layers built-up on the substrate is essential for quality control and process improvement. Since various layers grow after one another, a conventional surface image can only indicate the possible fault on the final layer but not accurately indicate if the cause originated from further down in the sample. 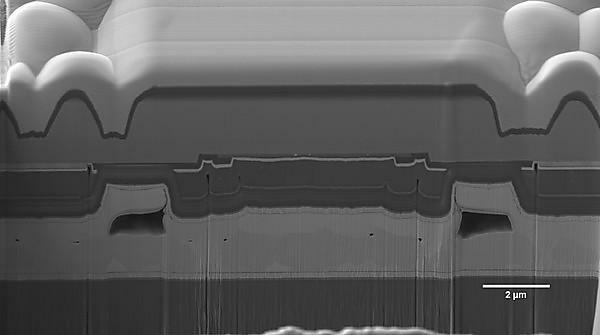 In this case, with the help of the FIB-SEM, a cross-section view perpendicular to the surface made by FIB can easily reveal all layers and check their bonding with high-resolution SEM imaging. FIB milling into several suspected areas and try to locate the faults beneath the surface with live SEM monitoring. High-resolution imaging when imperfections are spotted. Elemental analysis on the cross sections for the elements present in the various layers. As indicated by the red arrows in the image, some nanoscale voids were located just beneath the top surface. The majority of the layers bond well on top of the substrate. With such high-resolution images, the engineers have a clear view of where exactly the defaults take place, which helps them track back the manufacturing processes and have a better clue of what may be the root cause. In addition, elemental analysis is very useful in identifying defects and reconfirming the layerings.